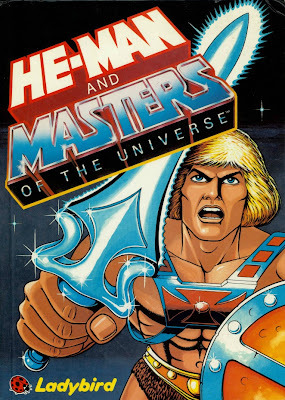 He-Man and Masters of the Universe (no, there’s no article) is a 1985 Masters of the Universe children’s book written by John Grant and illustrated by Robin Davies and George Fryer. In six short stories, He-Man encounters a stegosaurus, Queen Marlena contracts a deadly virus, Man-At-Arms leads a mining expedition, He-Man gets his Talon Fighter hijacked, alien refugees land on Eternia, and Skeletor travels back in time to recruit an ally. All of that sounds quite a bit more interesting than most of it actually is. The shorter format works better for Grant, as there’s less need for the nonsense filler he tends to put in the other Ladybird He-Man books. However, it’s still plagued by Grant’s lazy, holey plotting that doesn’t respect the intelligence of his child audience. To wit: in “Dragon from the Lost Valley,” a stegosaurus is apparently a ferocious dragon on Eternia (and what’s to keep it from coming back out of its valley, or Skeletor from going in after it?). In “Pinnacle of Peril,” why can’t Man-At-Arms just override the controls the instant he finds out the Talon Fighter’s been stolen? In “Warlord of Eternia,” Skeletor and Evil-Lyn go back in time and their magic doesn’t work because energy weapons haven’t been invented yet. Even worse, Grant has little regard for the things that make He-Man He-Man (or perhaps more accurately, the things that don’t). He doesn’t know what color Panthor is, or Orko, for that matter. The characters are all telepathic, and He-Man shoots beams out of his sword, which also glows for danger and apparently has a built-in radio (which is particularly inexplicable given everyone’s telepathy). Castle Grayskull is used as headquarters for the Heroic Warriors. Zodac is one of Skeletor’s dull minions. I could go on; suffice it to say that these are all the sorts of things that readers of all ages may well find insulting. That said, it’s not all a disaster here. Aside from the glaring stupidities in Grant’s writing, the stories are all more or less fundamentally sound, and work well enough. “Menace in the Marshes” actually has some atmosphere and suspense, although, in typical Grant fashion, He-Man reveals his secret identity to Mer-Man’s entire army. And how, exactly, they were going to go about mining in a marsh remains unclear. “Warlord of Eternia” is a neat idea, and one of the better entries here even though He-Man doesn’t appear. It’s nice to see Beast Man doing well for himself for a change. 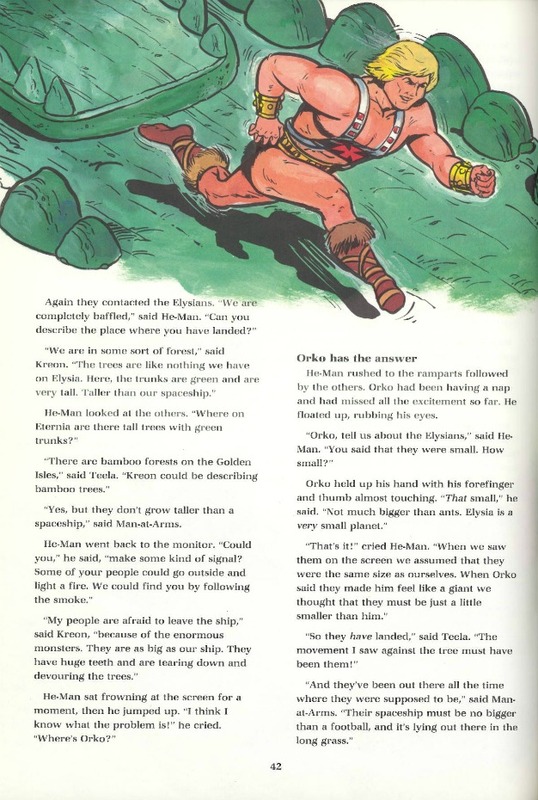 Davies, who illustrated all the other Ladybird He-Man books, does about half of the illustrations here, and it’s more of the same, with his good colors, chubby Castle Grayskull, and character depictions ranging from adequate to terrible (just look at page 42; ugh). Of special note, the art design for Eternia’s past in “Warlord of Eternia” is well done. Fryer does the other half of the art; his work is less stylized than Davies’, but generally more competent. What to say? The title of the book is dumb and it doesn’t get a great deal better from there. This is a mediocre collection at best.